viaLibri ~ Bushire (N.H-39, fourth edition). Tehran (N.I-39, third edition). Bushire (N.H-39, fourth edition). Tehran (N.I-39, third edition). [London], Geographical Section, General Staff, 1951. - Silk-printed colour map, 1:1,000,000. 68 x 62 cm. 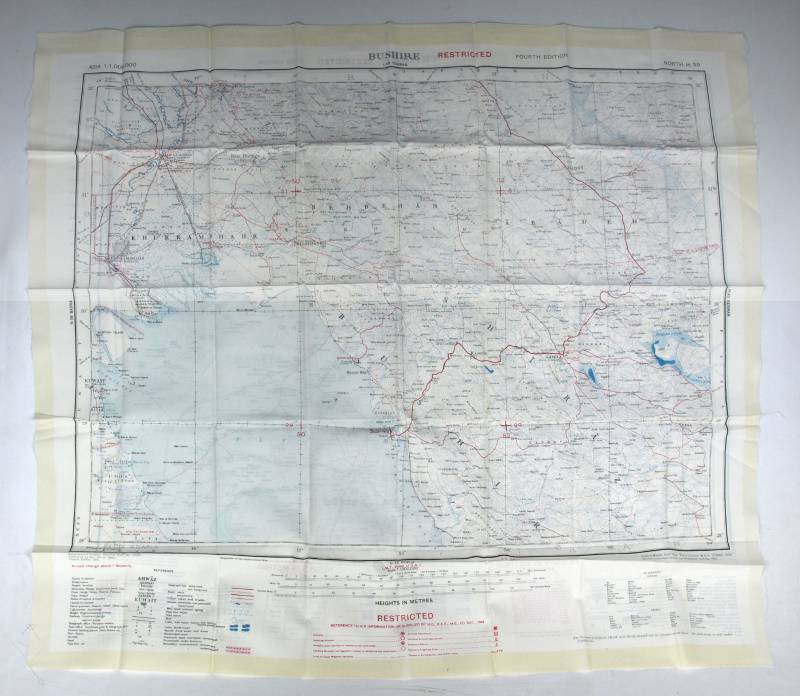 Classed as "Restricted", this Ordnance Survey map, printed on fabric to sustain extreme conditions of weather and handling, shows the northern end of the Gulf from the Saudi Arabian border and Kuwait, the Shatt Al Arab with Khorramshahr, and the Iranian coastline to Bushire and beyond. The reverse shows the area north of this, including Isfahan and Tehran. - Very rare; in clean and apparently unused condition. Folded. OCLC 249320989.